Last night I suddenly realised that today would be 1st December and I was rather unprepared. So the Queen and I had to delve into our cellar to retrieve an old Celebrations chocolate tin and stomp about the garden for a good twig. Then we had to track down a suitable buckety receptacle and scrabble in our gravel to fill said receptacle. Yes, it’s Jesse Tree time in the Vicarage. If you’re not familiar with the Jesse Tree tradition, I’d like to heartily commend it as a great way to keep Advent Christ centred. A good Advent calendar with bible verses is a start, but using a Jesse Tree helps us to focus as a family on the coming of the King. The tradition is to hang an ornament on our bare twig every day of Advent and have a bible reading and questions about bible passages which point to the coming of Christ. The ornament reminds us of the bible passage or a person who heralded Christ in the Old Testament. A Jesse Tree is a visual bible overview and helps us all to remember God’s great plan of salvation which led to the birth of Jesus. Originally I used an activity book which had suggested readings and ideas for making the symbols to hang on the tree for each of the 25 days of December leading up to Christmas Day. 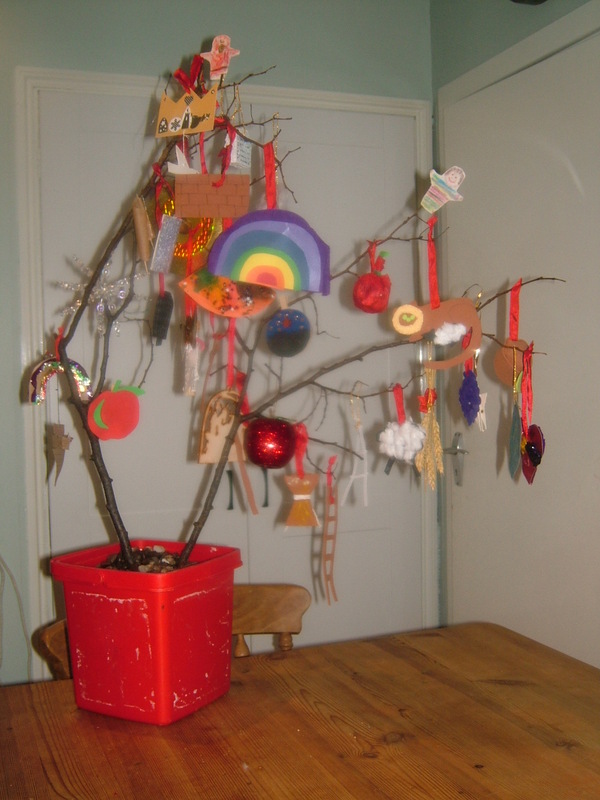 Then I also read about the Jesse Tree in the excellent book by Kent and Barbara Hughes ‘Disciplines of a Godly Family’. And if you Google ‘Jesse Tree’ you can find a huge variety of suggestions for how to make your tree and which bible readings and symbols to use. We made our decorations over a couple of years. When the kids were very young, we only had about half of them. I fondly remember a wet weekend the first Christmas of the Vicar’s curacy when my parents joined in construction of the missing ornaments in our steamy kitchen. We also have a few ready made decorations in the tin. The simplest option is to find some images to print out, and use blutack to fix your symbols to a picture of a tree. An American magazine seems to have done this. In the end I ended up compiling our own Jesse tree list and readings, with symbols, readings and suggested questions. I also listed out the single verse readings on a sheet of paper using the NIrV, but I’ll not post that because I suspect I might be breaching copywrite. Last year the Queen and the Joker were able to take turns in reading from the sheet of verses. This year I’m intending to get the kids to find the bible passages in their bibles (International Children’s Bible for the Joker, NIV for the Queen) and then read. The Engineer might even be able to read out a few. If not, he can read out the questions. But I hadn’t been bothered to find out what one was. “twenty one stories presented from the Old Testament that will paint on Old Testament backdrop to the birth of Jesus and then the Christmas story presented in three episodes.” It’s been recommended as an alternative Advent Calendar. Read a story each night until Christmas. Thanks for the links, Tim and Alex. One friend of ours (without kids) made an Advent calendar of photos of friends. She and her flatmate prayed for a different friend every night and ate quality chocolate. That Advent calendar choc is very low quality. The link to your own Jesse Tree list and readings mentioned above sadly no longer works. Please could you add an update so I can find it – or have you had to remove it completely? Thanks – works fine now. I have seen similar before but never with a list of ideas. Very interesting! Pity the activity book you mention seems to be no longer available. I enjoyed reading your blog post about the Jesse Tree. It popped up as a link on my own blog, as I am also blogging about the Jesse Tree. What a fabulous tradition it is, especially to teach the kids about our Salvation history. Nice to know others (in other Christian religions) around the world are honoring God in the same way.